If you’ve played Call of Duty, you may remember the levels where you fly in an AC-130 and target the enemies below in a fantastic display of aerial firepower. 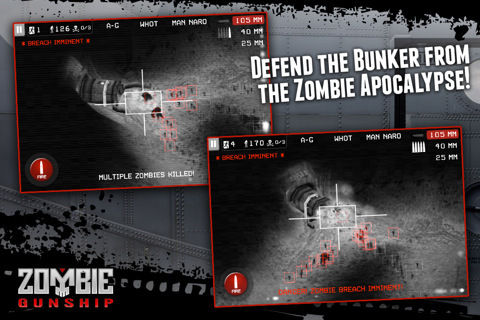 Well, Zombie Gunship [$0.99] by Limbic Software is based on that idea. In the game, you look down over an apocalyptic landscape and wait for enemies to appear on your radar. Suddenly, a solitary human figure rushes from the shadows, trying to escape from hoards of brain-loving zombies. This is where you step in, to save the day. You must shoot the zombies below, before they eat the few remaining humans or reach the bunker. If one lifeless zombie reaches the bunker, it seals itself to avoid being breached and your mission is over. There’s heaps of defense-type games, but Zombie Gunship stands out because of it’s stark realism. Your view of the terrain is provided via a grainy black and white night-vision display, just like using the targeting systems of an AC-130 (or as video games lead us to believe, anyway ). Also, because you’re in a plane, your position and perspective slowly change, although this is so subtle you barely notice. There’s no music or unrealistic sound effects, just the noise of the airplane engine, occasional military chatter on the radio and the sound of your own gunfire. Even the opening menus have no background music, which seemed odd initially, but now I really appreciate that this all adds to the realistic military feeling. Weapon upgrades provide a strong incentive to keep playing. There’s three different weapons, ranging from a gatling gun for picking off individual zombies, up to a crowd-destroying 105mm howitzer cannon. It’s super satisfying to blast those zombies using the various weaponry, and it’s even more fun once you start upgrading weapons via coins earned (or bought) in game to fire faster and cause more damage. You’ll need that extra fire-power too because there’s some bigger zombie “things", down there as well. But be careful, don’t shoot too many civilians, or your mission will be aborted. Game Center is used for player rankings, but unfortunately there’s no achievements, difficulty modes or career statistics available currently. Limbic has said they plan on supporting the game via updates, and it wouldn’t surprise me to see these missing features being patched in first. The developers have mentioned in our forums that if the game does well they’ll look into releasing a iPad version (or potential universal update). The good news is, Zombie Gunship has rocketed up to #2 on the App Store charts, making iPad support seem fairly certain. While this success is deserved, the game definitely needs some more maps, to provide variation from the single landscape provided and it would be great if you could customize the controls, as I’d love to tweak the position of the fire button. Limbic Software have done a fantastic job with Zombie Gunship. Also, per the iTunes description, the sound design is by the same person responsible for the audio in the Gears of War, so when you download this game (and you really should) be sure to play it with headphones to appreciate the effort that went into the audio. One last thing to keep in mind, Zombie Gunship has entirely optional IAP which only serves to allow you to unlock weapons faster. You never need to buy anything, but it’s just something to be aware of if this kind of IAP ruffles your feathers. Now, I’ve got to get back to raining hell fire upon legions of zombies.